TAEKWONDO: It's not all about the kicking and punching, it's the discipline behind it. 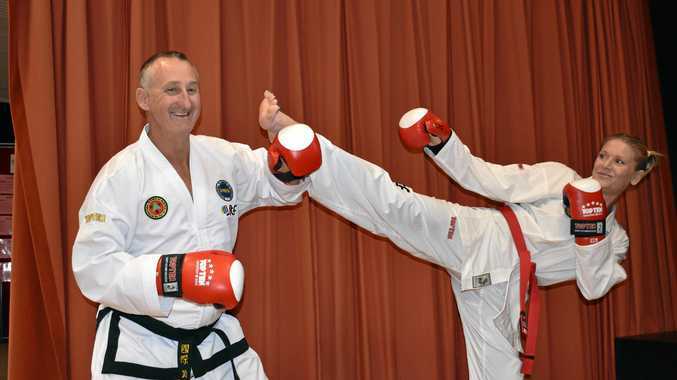 Those are the words of wisdom from Bai Rui Taekwon-Do Laidley instructor Darren Finch in the lead-up to the 2018 ITF World Cup in Sydney this week. Finch and student Catherine Ovenden have worked tirelessly over the past 18 months to prepare for the event which will have over 1000 other competitors from 32 countries. They are both appearing in their first world cup and the duo will form part of a Bai Rui team of 60 that will be in action over four days. Finch, 51, will compete in the veterans men's hyperweight class and Ovenden, 43, in the senior womens over 55kg. "The biggest thing we're going to find because of the size of the competition is (a focus on) endurance,” Finch said. "It's not like the local competitions where you only have two or three bouts, we could have up to five. They have both overcome injuries in the build-up and sharpened their skills at intense training sessions in Brisbane every weekend. "I feel I'm more focused. We're a lot more focused on things we want to achieve,” Finch said.